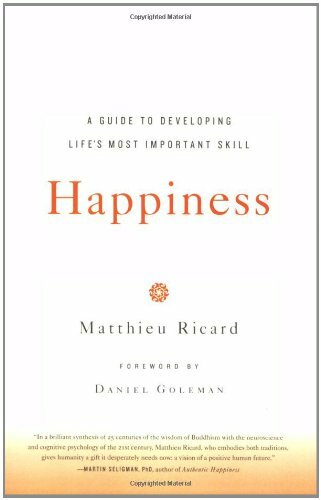 I've been looking for a book on happiness or focusing on the positive, and let me tell you, there's a lot of crap out there. As one author wrote, once you read a self-help book, realize it doesn't work, then come two shelves over and pick up my book. Except I didn't like the arrogant tone of his book either. Happiness is not a goal to be ridiculed, nor is it merely something that must be derived indirectly. Nor should it be dependent on the external facets of life. If we can learn to maintain a state of equanimity, then we can weather the inevitable storms that life will bring us. His approach is well grounded in experience. The texts he refers to feel substantive while still being accessible including Andrew Solomon's Noonday Demon and Martin Seligman's Authentic Happiness. One of the parts I found most helpful was three strategies for coping with negative emotions. We all know that simply trying to avoid anger or sadness doesn't work. Instead, he suggests we replace the negative emotion with its opposite such as altruistic love rather than hatred or patience with anger. Another strategy is to look more generically at the emotion as just an emotion, and allow it to dissipate by doing so. I have been able to do this by letting myself just sit with the emotion and completely letting myself feel it and then move past it. His final strategy is to use the positive aspects of an emotion to catalyze change in yourself. For example, anger can be a really energizing force. If you can separate that energy from the hurtful aspects of anger, you can use it towards fighting against injustice. Throughout the book, Ricard offers simple meditation exercises. My honest reaction to this is probably just a sign of how unenlightened I am: resistance. Why do we have to learn to meditate in order to be happy? I don't know why I'm so resistant. I enjoy being sedentary and I enjoy contemplating. But meditation just feels like there are too many rules. So, while I appreciated the overall tone and quality of this book, I'm still struggling with the core message. The upshot of this resistance is that I'm not sure I'm any closer to happiness after reading this book than before. But Ricard says it is a skill to be honed, not a quick fix. More than any other book I've read on meditation, this book has made me want to meditate because doing so can alter the neuroplasticity of our brains. Meditation experts emit more gamma rays than novices. I'm not sure why gamma rays are desirable, but the whole idea of training yourself to know yourself better and have better control of your brain is certainly desirable for someone as introspective as I. The only caveat I have is that after reading this book, I found myself searching for guides to meditation other than this one. This book is really good for motivation and general orientation, but maybe not so good for learning how to meditate because the exercises are so simply described. *Because of this caveat, I have changed my original rating of this book.